A living room rug ideally needs to fit seamlessly with the room's style, reduce any echo, and (for all you flat dwellers) stop the downstairs neighbours from despising you. Now that's a lot to ask from one accessory. Add to that, it has to be the right size for your living room and be easy to clean, and you've got a real hunt on your hands. Luckily, we've rounded up our favourite living room rugs that tick all those boxes – we hope you'll find one you love. Want more tips on designing a living room? Check out our guide. This rug is all about combining subtle design with suitable material. The quatrefoil motif of this rug will introduce transitional style patterning to your home. The block shapes and beige tones stop it from being too loud and a few reviewers have mentioned that they use it to lift neutrally decorated rooms. Cotton itself is highly durable, and combined with synthetic fibre, should provide you with a healthy lifespan. Its light colouring may not make it the best choice if it’s guaranteed to lie in the danger zone of spillages and potential staining substances. This wool rug brings timeless style to the table. Its patterning and colour is classic and, matched with curtains or cushions, will lift a lounge and bring a level of vibrancy to the room. Made from 100 per cent wool, it’s very durable, and it will hold well as a hearth rug too, as the material is naturally flame resistant. If you have a household full of kids, the deep, rustic red will do a good job of hiding minor stains and wool itself is easy to clean. The only thing to note is John Lewis recommend a rug hold, as the colouring may transfer on to light flooring. If you’re a fan of light interiors, this rug should fit the bill. Largely beige with flecks of interwoven blue, the colour this rug brings to the room is subtle. Blend with neutral or grey shaded decor and the room should feel harmonised. Made from polypropylene, it’s resistant to wear and tear and staining, and is tough and durable, which makes it a great choice for areas of high footfall. Reviewers seem to love the style of the rug but where it’s designed to sit flush against the floor, some recommend a rug hold and the corners may take a while to flatten down. 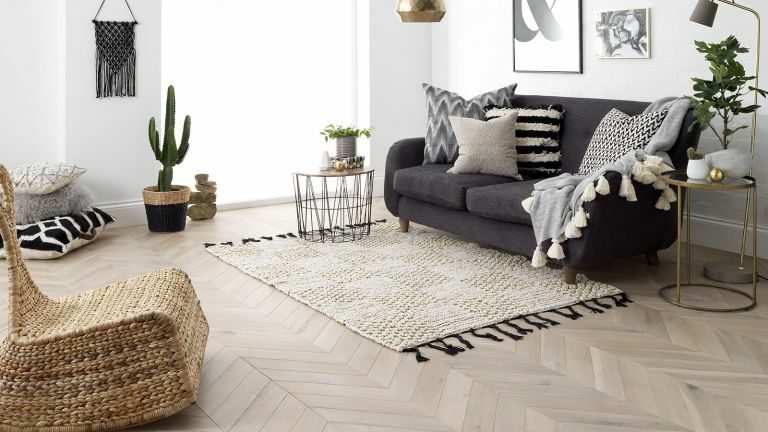 Handwoven with a stylish black and white chevron design, this Jay Black & White Rug from Swoon Editions makes the perfect addition to a contemporary space, incorporating pattern without overwhelming a space. Pair with other prints for on-trend pattern clashing or as part of a simpler scheme. Designed with on-trend, contemporary spaces in mind, the Diamond Berber Rug from John Lewis & Partners could be the option for you if you have a modern interior style. Made from 100 per cent wool, it's soft underfoot, as well as stylish. Find more Scandi style room design ideas in our gallery. Hand woven from natural fibre, this 100 per cent jute rug makes the perfect addition to a space with a boho or pared-back feel. Available in a variety of sizes ranging from 80cm x 150cm to 200cm x 290cm, you're guaranteed to find a piece that fits your space. Find more boho-inspired room design ideas in our gallery. Looking for more flooring advice?